Daniel Frank Sedwick, LLC is working around the clock to present another big auction with over 2150 lots and a pre-auction estimate of over $1 million. Lots will be online around the first week of March and available for viewing in person at the Baltimore Coin Show March 3-7. Also lot viewing in person will be available by appointment at our private office in Winter Park, Florida, March 8-April 1 (weekdays only, 9 am to 5 pm). In great deference to the Sedwick patriarch, for the first time ever we will see selections from the Frank Sedwick study collection of 1715-Fleet gold cobs, including plate coins from past editions of the Practical Book of Cobs and other pieces never seen or offered for sale, coins that the pioneering "Dr. Cobs" kept as the best examples among thousands that passed through his hands. The unique opportunity to own a "Frank Sedwick" specimen will start in this auction with just two 1715-Fleet masterpieces: The finest-known Lima 4 escudos 1711 and one of the best Lima 8 escudos 1712 ever offered. Also in the gold cob category there is a choice Cuzco cob 2 escudos 1698, plate coin in Diving to a Flash of Gold by the legendary Marty Meylach, who found the coin and certified it. But perhaps most intriguing in the 1715-Fleet gold cobs this time is a Mexican 1 escudo that was flown aboard Apollo 14 in 1971, the only one of its kind. Before this specially engraved coin came to us, we had no idea that the Apollo astronauts included genuine shipwreck treasure in their "flown" souvenirs on their trips to the moon, but apparently the link between NASA and the Real Eight Co. was more than just geographic. We have come to understand that flown medallions made of 1715-Fleet silver are very hot with space collectors, who will no doubt go crazy for this genuine coin as well, but we hope the treasure collectors will win out in the end. And yes. of course we have a full date 1715, probably our favorite so far. Highlights in shipwreck silver coins will include large offerings of lion daalders from the Campen (1627), Potosi cobs from the Consolacion (1681) and the 1681 Fleet off Panama (first-ever offering, also with some artifacts and a great pirate story to boot. ), and–most importantly–hundreds of choice (and some interestingly shaped) 1715-Fleet Mexican cobs from the estate of Karl Goodpaster (Real Eight Co. conservator), as well as hundreds of Mexican cobs from the Rooswijk (1739). The Goodpaster collection in particular will be fun to watch, as nothing is hotter today than Fleet silver cobs. In the non-wreck cobs sections we will feature the John Pullin collection of over 150 choice, dated Mexican silver cobs, in addition to Part II of the Mark Bir collection of cobs from Mexico, Lima and Potosi. Also highlighted will be the mints of Panama and Santo Domingo, as we will feature several Santo Domingo SILVER and copper coins of Charles-Joanna AND Philip II in addition to THREE Panamanian silver cobs (half, 1 and 2 reales), following the record-setting prices for such coins in our last sale. Our Spain-cobs section will have an abundance of Ferdinand-Isabel coins in all denominations, including a set once featured in PLVS VLTRA Newsletter. One last surprise: the Louis Hudson collection of zoomorphic cobs. You won’t want to miss it. The general world silver coins section will be massive, featuring the John Pullin collection of Mexican War for Independence silver coins (just in time for this year’s Bicentennial of Mexican Independence), Mark Bir’s milled Spanish colonial coins (various mints), Part II of the Herman Blanton collection of Colombian Republic silver coins, and a HUGE section on all periods of Venezuelan coins (over 100 coins), in addition to many other Latin American countries. Before we get to the artifacts, let’s just say there will be a wealth of gold and silver (and even copper) shipwreck ingots too, both Spanish and Dutch (VOC), including the world’s ONLY gold-bar clump. This museum-piece features twin, complete (over 30"), 1-kilo bars fused in near parallel by white coral, just the way they were found on the "Golden Fleece wreck" of ca. 1550. And then our trademark and exclusive, shipwreck artifacts: This time we will have a genuine bronze astrolabe, the most complete and intact one we have ever handled, fully dated 1656 and well detailed, solid and stable, alidade intact, one of fewer than 60 pieces known and among the best from any wreck. We will also be showcasing the famous gold box from the ca.-1810 "Coconut wreck," the single most important item found in this deep-water salvage venture, as it contained 13 gold coins (a Spanish dowry known as an arras) wrapped in an 1809 newspaper talking about sales of slaves… and yes, the intact newspaper comes with it. There will also be a genuine gold chain and massive silver candlestick from the Atocha, emeralds from many different wrecks, swords, flintlocks, and much, much more. – Session I (Wednesday, April 7, 2:00 pm EDT): Gold coins and ingots, silver and copper ingots and shipwreck coins. Featuring selections from the Dr. Frank Sedwick study collection of 1715 Fleet gold cobs, plus a Fleet gold cob that went to the moon on Apollo 14, also significant gold rarities from Chile, many pounds of gold and silver bullion (including the world’s only gold-bar clump. ), and very large sections of silver cobs from Consolación (1681), 1715 Fleet, and Rooswijk (1739). 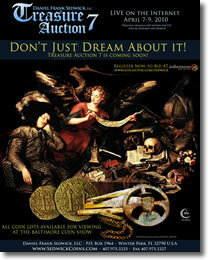 – Session II (Thursday, April 8, 2:00 pm EDT): Silver cobs and world silver coins up to Mexico. Featuring the John Pullin collection of choice, dated Mexican cobs, plus numerous important silver cobs of Santo Domingo, Panama and Spain, also significant offerings in Costa Rica and other Latin American rarities. – Session III (Friday, April 9, 2:00 pm EDT): World silver coins from Mexico to end, medals and paper money, stamps, artifacts, documents and books. Celebrating the 2010 Mexican Bicentennial Anniversary. Featuring significant offerings in Mexican colonial and War for Independence; a large collection (rarely seen) of Venezuelan imitation cobs, colonial coppers and modern, including many rarities (some never offered at auction before); also a genuine bronze astrolabe, the famous gold snuff box from the “Coconut wreck” (ca. 1810), swords and flintlocks, old and rare documents, and more. Register today and bid online at no extra cost: www.icollector.com/sedwick.